I have a boarding barn where the pastures have been eaten down. In lieu of the grass I now put out a fairly decent round bale for the horse to eat off of. I observe their behavior and essentially there are no bullies hogging the bale. Can this practice be acceptable for horses on dry lot when pasture is not available. We also rotate a few of the horses so basically everyone gets 12 hours on the bale and when any horse is in the run with stalls they get their hay in flakes. Everyone is fed a forage type pellet 2 times a day in this rotation and there is ample fresh water available. On the surface this sounds like an acceptable practice, although I’m not a huge fan of round bales because they take some effort to feed properly and can provide very inconsistent nutrition. For example, round bales really need to be protected from rain and moisture so they don’t develop mold. You don’t say how many horses you have or how quickly you go through a bale, but consider putting it under cover. Of course, having it in a shelter may cause some dominance behavior to appear, so then you’ll have to address that. I like that the horses still get flakes of hay separately in their stalls and that they’re getting vitamins, minerals and protein from the pelleted product. Can I assume that salt is available? Your task while feeding a herd of horses from a round bale is to exchange the eaten down one with a fresh one before they are forced to eat potentially harmful material and to closely monitor the body condition score of each horse so you catch any weight loss before it gets severe. I love round bales in the winter my horses are very round when they have in front of them, I was wondering if the grain pellets are heated to make how does the horse receive the minerals from it? Check out these covers they protect the hay and save on the tractor! I feed round bales through the winter months, I never have through the summer. But, I would make sure it is in a round bale feeder so that the do not trample through it and defecate and urinate on it. I agree with the Dr. I only purchase ones that were in a shelter, I store them under shelter up off the ground on pallets and when I put them out in the field I cover them with a tarp to keep the weather off. I wish I could fee flakes as most vets recommend but I work full time and they would run out of hay in 2 hours and no one would be there to give them more. Just make sure it is good quality and you take the time and effort to care for it properly. You indicated you cover you round bales with a tarp to keep the weather off when it is out in the field. How do you cover it and still allow access to the bale? Round bales that are from a trusted source and meant for horses are great! They do take a bit of extra work but are invaluable when you have no one on duty to feed all day and night. I watch each bale closely and assure they eat it rather quickly so it does not spoil. Managing to keep the easy keepers thin is my only issue when feeding round bales. They can be very economical for those on a budget, as well. There are some hay nets for round bales that limit access. They have small holes and require the horses to work to get the hay. This works very well for my 4 easy keepers. I have also gone to small hole hay bags for wet weather. I have been feeding round bales in the field for several years now. I feed square bales when they are in their stalls. I have 7 horses and they go through about 1 round bale a week. I use a round bale feeder to keep them from messing in it. It is important to get your round bales from someone who bales them for horses and ensures that they are kept dry and under cover. Always check the bale for mold before feeding. Another issue to consider while feeding round bales in addition to the comments Dr. Gray left, is that water intake. Just because horses have water available to them does not mean they are drinking it. So now you have removed water from their diet in the form of grass and you have increased the dry matter intake of your horses thus leaving your horse with less moisture in their gut. That coupled with the hair pin turns and decreasing diameter of the intestine coupled with the fact that horse have a cecum, ie. blind sac with the in and out being the same hole, and the fact that we usually feed a coastal( some sort of bermuda grass) hay which is notoriously fine and pre-disposed to packing quite well against itself, you are kinda setting yourself up for impaction colic.Also, you say you are feeding “forage type pellets” which is awesome, but are you feeding it with water? That would be a great way to ensure your horses are getting adequate amounts of water and forage and most horses really enjoy it. Particularly when their are great weather changes such as a steep rise or fall in temperature, horses tend to go off water for a day or just limit thier intake and that is when we start to see an increase in colics. Are you feeding straight forage pellets or is it a grain? A complete feed is also a great way to ensure your horses are getting enough forage along with their proper vitamins and minerals. Are you feeding alfalfa pellets or grass pellets? Make sure your ration is formulated to what ever you are feeding for appropriate calcium and phosphorous levels. If you are not feeding a concentrate you do need to make sure your horse is getting vitamins and minerals. You can also consider getting the large bales(3x3x10) which give you great big flakes for haying in the pasture in larger volumes that are still easy to handle. This works great on our farm in addition to a personalized wet forage supplementation for each horse( ie, beet pulp, timothy, or alfalfa) Round bales are easy, but they can end up costing you more in the end. i have a dry lot and i use rounds bales during turn out, but i also feed quality hay both am and pm. i have 5 that share and they are pretty happy together. it is also kept in a indoor workout arena. I used to feed round bales; it was convenient and less expensive. One night our old timer quarter horse decided to eat and not drink, and he died due to impaction colic. It was a heart-breaking discovery in the morning. I now buy timothy square bales. Have you had any problems with the horses chewing on the orange plastice fence holes while they are munching on the hay bale? Have you had any problems with your horses making the holes larger and possibly ingesting the plastic? How do you contain the hay with the fence? Do you have the fence wraped around the hay bale? If so do you move the fence in as the bale gets eaten? Also I was wondering is the hay sitting on the ground or do you raise it off the ground some how? I’m also not sure what you mean when you say the fence works great for “keeping the bales together”… please explain. You are refering to Round Bales in you post correct? One of my first fears would be that one of my horses would put his hoof thru one of the holes in the fence and get injured. Another thing I thought of right away was what if the fence got stuck on a hoof and they paniced and took off running with the fence stuck on their leg, they sure could get hurt that way also. No matter how I try to figure out how you have this working well for you I just come up with another way one of my horses *might* get hurt so, it would be great if you could share how you have this just in case someone else wants to try it for their horses. I am very interested in this method too. Could you please explain yourself further. I have been using round bale feeder from a long time. I do agree with the fact that it’s pretty difficult to maintain the hay bale feeders. But Round bale feeders are very effective in feeding cattle. I find this very interesting. 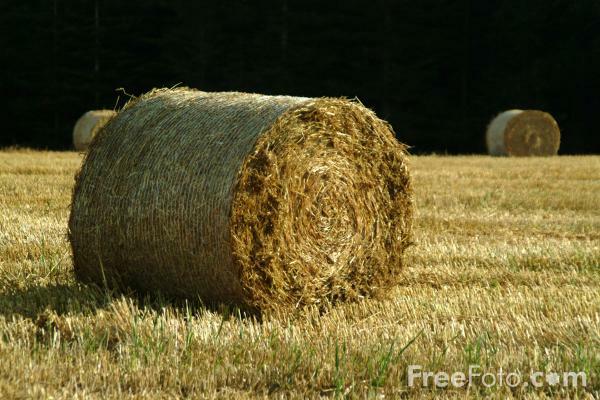 Here in Ohiuo due to the drought we had hay bales are near impossible to find, and when you do it is 10 dollars a bale. I plan to use both round and square to get through this winter as I am not sure I have alot of choice. I do have salt for the horses and they are currently on Purina Senior feed.